Leave a comment on this post by 2/23/2017 to become eligible to win one of twenty complimentary copies of Chip Bell’s new book, Kaleidoscope. My conversation with bestselling author Chip Bell transformed my thinking. I wondered what a customer service expert would offer my leadership audience. Boy, was I surprised. Chip talked about customer service that people tell their friends about. I started thinking about the stories people tell about their leaders. Ouch! 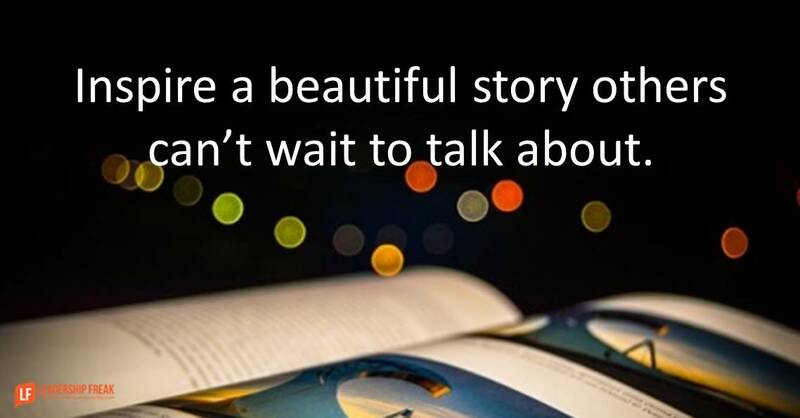 Inspire a beautiful story others can’t wait to talk about. Begin with the stories you want others telling about your leadership. What do you want your teammates saying about you to their family and friends? What’s important to you about those stories? Do you want them saying you’re decisive, kind, a good listener, or inspiring? Find energy by asking yourself why you care. Practice behaviors that create the stories you want others telling about you. How might you listen in such a way that your team members go home and say, “I can’t believe how well my boss listens to me,” for example? Adding the term ‘customer’ to servant-leadership reignites an outward shift. The difference between servant-leadership and customer-servant-leadership is focus. When you say servant-leader you think about qualities and behaviors servant-leaders possess or lack. But add the term customer to servant-leader and the focus shifts to others. Servant-leadership is about others, even though we typically make it about who we are. Elevates the importance and challenge of humility. ‘Customer’ reminds you that it’s not about you. Provides focus to leadership development. What qualities and behaviors align with your strengths and bring the most value to the people you serve? Develop your leadership to elevate the value you bring to others. How might leaders bring customer service into their approach to leadership? Winners have been selected and notified for this giveaway. Leave a comment on this post by 2/23/2017 to become eligible to win one of twent complimentary copies of Chip Bell’s new books, Kaleidoscope. I thought this article provided an interesting way of how to think about servant leadership in a way that ensures we are specifically thinking about others. It SHOULD be implied within servant leadership, but as your article points out, that’s now always the case. Love the concept of customer servant leadership. It does indeed help to refocus toward the real meaning. Most of the time we are so focused on the metrics and productivity that we forget to focus on the other parts of leadership. Thanks for another great reminder of the things that matter! Hi Dan. “Begin with the stories you want others telling about your leadership.” Wow! That is a succinct and powerful way to capture an important leadership lesson. Thanks for another quotable quote! I love the idea of viewing those you lead as customers. After all, if they are NOT your customers, who is? Great concept! I absolutely love this post! As a leader in a university our customers are our students. We make many decisions every day that ultimately impact them as students and consumers. We just discussed servant leadership recently in our lead team meeting. Now I am going to intentionally add “customer” first to keep the customers as the focus. This certainly adds a dimension I would not have thought to include – especially by using the term customer. I work in education and this is not a term generally used but it really helps me change or add a new dimension. It goes so well with the strengths based work you talked about a couple of weeks ago, as well. I have been studying servant leadership lately as a means to help me and my team better at what we do. Interesting concept to add customer. As someone with a very strong Customer Service background who is now a leader, I find this post very insightful. In the Customer Service field, we are taught that Customers are the reason that we even have a job. Making them happy is job security. It is important to build a rapport in order for the customer to trust you and engage with you. I am now learning how to be a leader in a totally different field: I want those who I work with to say I am a good listener and that I seem to care about them, even beyond the workplace. I want them to trust me and I want to engage with them. I know that if I can accomplish this, we will be a better team. I agree with Michael Hales, the question about how you want others to talk about you gets people thinking! Being a Customer-Servant-Leader is something we should all aspire to. Great post! What a great way to emphasize the focus that was there all along. But it “freshens” the concept and re-orients us. fascinating! This is a great distinction. Thinking about “the qualities you would like employees to say about you” moves the dial from the typical leadership measurement of success. What a great way to define your growth and development plan focused on your team as customers. Truly a shift in thinking. Thank you for the synopsis of this book. It’s interesting that the leaders people talk about are those who realize that leadership is not about them! I like the idea of first thinking about what I want others to say about me, and then conforming my actions accordingly. This is reminiscent of Stephen Covey’s topic of beginning with the end in mind, only doing it on a more frequent basis. I think it’s easy to forget that humility is key in customer service. Thanks for the reminder! True humility comes from the Lord Himself. The embodiment of who He is and How He served and loved those around Him will display true humility of a leader. In a job interview yesterday I emphasized the importance that if it ultimately doesn’t help the patient (customer) than my leadership is heading in the wrong direction. I’ll now add patient stories that exemplify the strategic directions ultimate results. Thanks for the idea! “Inspire a beautiful story others can’t wait to talk about.” What an impact statement! I captured this quote in my affirmations as my daily reminder to live and lead how I want to be remembered. Great stuff! Thanks, Dan. I really like the focus change to customer. Too often we are focused on ourselves. Thanks! Also, the book sounds really interesting. Please enter me in the drawing. This one really resonated with me. Especially since I am working with my training team to not just be trainers, but to be the leader for all employees, C- level included. Very inspiring. Thank you for sharing and the opportunity to win more knowledge! I have a fair boss and I’ve been given an overall outstanding rating. I’ve expressed openly the desire for growth and added responsibility which could lead to a future promotion. My boss recently expressed that my current job is a good fit for me. My inner monologue was shocked that he would dare tell me that. I made a mental note never to tell one of my employees they are in the right job if they expressed interest in growth and a promotion. To me, adding customer service to servant leader indeed reminds a leader it is not about the leader rather if I have an outstanding employee, what can I do to keep that person in my firm/agency? Thanks for giving me a “light bulb” moment on how to be a better leader. Dan would love to bring this to Cerner. Dan, the concept of adding customer to your long-standing concept of servant leadership really hits the nail on the head.By changing the leader’s focus completely on the needs of your CUSTOMER helps us be much better leaders! Great advice to think of what others you lead may say about you. I truly believe that Leadership is about others. The more you help others develop their skills the easier it should help to make your job. It’s important to have quality support to back you up. No one can do it all alone. I loved this post because it takes the focus from “who I am” to “who I want to be”. Often times, leader’s self perception is misled by things like ego. However, when the focus is on “who I want to be” so our costumers can talk about it, then there is an action plan laid out of the behaviors we want to display. I appreciate Chip talking about the difference between servant-leadership and customer-servant-leadership. That is where our focus needs to be – on our customers. Really interested to hear about the idea of customer-servant-leadership and would like to hear more! I am fortunate to work for an organization that has a Servant Leadership focus and it truly is based around the customer experience. I thoroughly enjoy receiving your blogs daily as they are a great reminder to refocus my efforts to ensure I are providing effective leadership to our team. In reading this I thought about how I’ve always tried to lead the way I would want to be led. I strive to place our customers first and serve in a servant-leader role. I’ve held many positions in leadership and the most frustrating is the one where the higher management professes servant leadership and forget about those they supervise. My staff have always been told to be “Fair yet Firm” in their approach and this is the one thing I know they would say about me. I do not sugar coat and will give constructive criticism and will be the first to praise them on a job well done. I believe the customer servant leader could lead this way. Lead the way you wish to be led! Nancy McGovern, I meant to hit Like, not unlike. Good Article. Thank you for this format of getting information out. I would love to get the 20 free books to share with new leaders in our organization. I know I only get one…. I enjoyed this post, and your adding the word customer to customer-servant-leadership. It does make our minds shift in new ways to serve. Servant leadership is about others, and the danger of forgetting that is real. I need someone to explain to me how ‘customer’ moves us away from the leader; doesn’t it move the focus of whom we serve from those we serve by leading (ie staff) to the customers we serve through the ‘product’ of the organisation (ie. education, tennis shoes or dishwashers)? I believe he hit the nail on the head. As always, thought-provoking and current! I was looking for a way to get my managers to “see” how their employees view them and this does that well. I also like to use this in my personal life, to gauge how people will remember me when I am gone. Your articles are such a shot in the arm every day for me. I never thought of Servant Leadership in this way. It was very Eye Opening! Thank you! Fascinating idea — always good to discover ways to “mature” leadership skills. Great concept. I am a business strategist for nonprofits and my focus is totally on this concept. Coupled with effective stories of social change, it’s the only way to get people talking about you in a positive way! Great information and perspective. I am a business strategist for nonprofits and motivating people to view the nonprofit is a positive light and then take positive action is the focus of our stories of social change. I am most definitely a servant leader and applaud others who are also. It IS about helping others in need and makes me wants to know more, especially as I guide my Philly area career transition organization into becoming a nonprofit! We have over 2500 members on our meetup and are looking to grow and expand as we put our board together with a lot of talent from other servant leaders! If there is a platform for servant leadership that people go to for info and ideas, please share! Thanks for your powerful article.It is fulfilling to learn how to serve and also at the same time groom servant leaders.Life is at it’s best when we serve one another.How can I serve you today? I like the addition of customer to servant leadership and the reminder about humility and “it’s not about me! Love this post. It’s a good reminder to look at the gaps in how we’re perceived and how we want to be perceived. Chip Bell was one of the first authors I was introduced to in my graduate program many years ago. This inspired me to grab that book off the shelf again. This post came out at just the right time for me! I have always believed that part of being a good leader is making “it” all about others…the Customers (always with a capital C) and the People (also always with a capital P) who in my line of work are giving direct care and are most definitely the hardest working folks in my facility! Thanks! Love the concept of stories and using them to impact others. This puts a good spin on acting in such a way that others want to tell stories about you. That is when we are truly making an impact. Working in IT, we have internal and external customers. This is a good reminder that our leadership changes when we stay focused on them. “But add the term customer to servant-leader and the focus shifts to others. Although I’m glad you wrote on this topic, it is so disappointing to read that adding the term customer to servant-leader shifts the focus to others. That simply means many don’t even know what the basis of the term servant-leader is to begin with. To be a servant-leader, by definition, means the focus is on others. Help others and you will be taken care of. Help/focus on yourself and there will be ongoing struggle. Servant-leadership has been a goal since I first read Greenleaf’s writings about 1990. A goal I still strive for, but have yet to say I have fully accomplished my goal. Thanks for another great post, Dan. Thank you for sharing, Mark Apgar. I am aware of customer service; however, was not aware of servant-leader until reading this article. Thank you for the explanation. I appreciate what this post says. I’m not dealing with customers every day, but the principals apply. Interestingly, I find that great Leaders not only generate great stories, but they are also among the Best of Storytellers! This is a nice piece that I enjoyed reading. I don’t nessicarily work in the public. I am a direct support professional and I deal a great deal of my work with those that I serve and all of the other staff and supervisors. This definitely makes you take a step back and really think about being the best you that you can be! Thank you! Thinking about this “Begin with the stories you want others telling about your leadership.” made me think in a totally new way on how my leadership is and may be perceived. It will definitely change my approach.Thanks for this. This takes on another whole level at schools… The customer can apply to students, parents, and even staff. Thanks for the reflection. The most telling point of this whole article is the comment ‘it’s not about you’ – this, for me, sums up what makes the difference between excellent customer service and everything else – great article yet again!!! I love the idea of envisioning the stories that you want your team to tell about you when they are with their families and then working towards those stories. It is similar to thinking about what others would say in your eulogy if they had to write one about you today. Very powerful! Customer-Servant-Leadership… I like that it appeals to more than just what the leader should be doing. I always preferred the term Selfless Service as it speaks more directly to me saying “Hey its not about you”. It can be difficult at times working with people who may not seem grateful, but in the end we are called to serve. This doesn’t mean bending over backwards at all costs, it is always finding a balance. To keep that balance I always remind myself that I serve in Truth and Love. …bring the most value to the people I serve.. I really like that part. I am going to be intentional in asking myself this question for each person I work with this week so that I can find at least one way to create a positive impact. Interesting to see how many comments are made when there is a chance to win something. Great way to engage with the readers! You always have great posts Dan, your blog has become a daily learning experience. I thank you for that! This reminds us of the importance of listening, humility and how we must always keep present the importance of serving others. Considering the stories others tell about your leadership brings a fresh focus to doing the right things and serving others. Thanks for the insights. What a great, meaningful article. Servant leadership is an absolute privilege. Hmmm. New perspective for the “customers” with whom I work. It really is not about me. More grace is needed, even on the days when grace is the farthest thing from my mind. Thanks ever so much for your perspective. Well done. Meekness not weakness. Treat other with respect. All part of servant leadership. Kathymc99, I meant to hit like, not unlike. Just think if leaders looked at their employees as valuable customers. How can I grow my connections (relationship, professional development) with my employee (customer)? Just remember you can’t FAKE IT. It is super to aim your focus outward on customers, it is superficial when it is not legitimate. ACTION must follow words! You had me at “My conversation with bestselling author Chip Bell transformed my thinking.”. Great, thought-provoking article Dan. Thank you! A great article giving a different persective – it links to the great coaching question. What woul others think? or How does your team perceive you? Powerful questions that assist in leaders building self awareness. Thanks! Love this concept of customer servant leadership! A thought to calm fears and inspire greatness……….You have been assigned this mountain to show others it can be moved. Such an inspiring perspective and paradigm shift! I work with retailers and so they are used to thinking about customers and leadership in 2 separate buckets. I love how you brought them together. And the concept of “Think about what stories you want people to tell” applies to the leader retail owners and to what they want their store to stand for. I’ll be sharing this at our Retailer Retreat next week. Fireflies vs. Worker bees – great imaginary. Great customer service companies are always assuming the best about the customer and act accordingly. I enjoy your posts! They encourage me to step up and be the leader i am destined to be. It is very motivational! I am working on literally having a library that has books that actually matter and have insight (not fiction). It’s time for the truth to be spoken !! Hey Dan, I always enjoy reading your posts. I work for a company who is extremely focused on our customers, is really great at it, and our approach is servant-leadership for our team. The problem I seem to be having is the team says we don´t focus enough on them and that it´s always about our customers. They want as much focus on them as we put on our customers. It´s the whole happy employees make happy customers philosophy. Should I try ¨employee¨ servant-leadership? I think my whole team would revolt if I suddenly started using the label ¨customer¨ servant-leadership. I would love to hear your thoughts. Thank you for your help! I could really use it with my guys. Thanks Jonny. I wonder if you considered your employees as customers if that would help. Even if you don’t change the language, it would be interesting to see how you might work it out on a day to day basis. thanks for your comment. Best for the future. I have recently found your site and I am extremely excited that God has allowed me to follow. Also having customer service background, I am excited to read more of what you have to share with us. God Bless. “Servant-leadership is about others, even though we typically make it about who we are.”..
that a real truth on how we behave like a real leader..
thanks Dan for your post! The great thing about coming from a customer service approach is it forces leaders to really identify who our customer is. Team members who directly report to us should be our first customers! Great post. Great ideas here! I will use the inviting my leaders to please the customer tomorrow morning! I really like the idea of having fireflies instead of worker bees! I think this idea would bring some personality to the customer service experience and allow employees to engage with their customers and really enjoy their job more. Providing unique service that inspires a customer to stop and think about the customer service they just experienced is HUGE! I love this suggestion “Practice behaviors that create the stories you want others telling about you.” I think if more people lead with that in mind, employees would have a much more positive work experience and in turn you would have a much more effective and satisfied workforce. That was a great read. I’ve heard Chip talk before about his book and learned a lot. In his book he talks about value unique and value added. Value added is adding something extra to a customer(team member) such as a bonus or a gift and value unique is adding a surprise and quality in an authentic way. In other words its something extra, but something extra with a little extra. Servant leadership is the basis of all true leadership. It’s rare to find genuine servant leadership as a customer. A leader leads whether they have the title or not! Titles are not important, what we do is! Sounds like a great book ! Absolutely! As a school administrator shifting my thinking to what “will add value to others” is critical! Thank you Dan! I’m an avid reader! Please continue the great work because it is positively infecting the thinking and actions of my organization! Less like worker bees- more like fireflies. Love this perspective! Thank you for this post! I am currently studying Servant Leadership at Trinity Western University and as a Human Resources Professional I would like to expand my thinking and knowledge further with Chip Bell’s help. What if your customers are the homeless and poverty stricken? I work at First United Church Community Ministry Society on the downtown Eastside of Vancouver, BC As Human Resources Manager, I support those who do the front line work to provide services and hope to those who are the most needy. Thank you for your consideration. Would love to read more about this! I have been focused a lot recently on servant leadership…this post is timed perfectly. Thanks for sharing! Have been reading a lot about servant leadership recently, so this post was timely. Great ideas…want to learn more about being a firefly! I LOVE the idea of Random Surprise. In our day to day duties and responsibilities I think this would be nice from employer to employee as well as employee to patient/customer. I also use the word “sparkle” or “fire starter” when identifying that special something we all have inside of us 😉 I will read this book!! And share my learning with co workers. This is exactly the conversation I’m having with my directors in our special education department. Raising our work and our service level to make it about others. This is a new concept for our directors – partly because they are not “in the building” every day, all day. . . they are just a layer away. Thank you for articulating so well the very concept I’m trying to help them learn. Great way to think about your leadership and what you want your brand to be! Just read Chip’s guest post on the blog and made me want to enter for a free copy of his book:) Sounds very interesting! I’d like to be randomly surprised by a new book to read! Thanks for the blog. Always good stuff here. This is powerful. To think of the people I lead as being “customers” is a great mindset to bring to work every day! I’ve always referenced our own people as our internal customers, whether they are peers or direct reports. Your external customer service will NEVER exceed your internal customer service levels. And I now know that “random acts of kindness” do as much for the giver as it does for the receiver (think fireflies)! I have had long conversations with others that I served with who took the moniker “servant-leader” negatively. I told them not to get stuck on the “servant” part. I tell them that I believe it is more conceptual; meaning that as leaders we need to look for opportunities to help others learn, grow, and become successful. Service to them means a better outcome to the team. We can certainly focus on mission accomplishment, but must foster the growth of all. It is one facet of leadership we simply cannot overlook. I like the subtle shift in approach, thanks for sharing Dan! Customer, goes right along with worker bees vs. fire flies. Humility and service is hard for some and, as always, a great reminder and a new way of looking at an everyday situation! “Practice behaviors that create the stories you want others telling about you.” Wow. It’s definitely a lens for leaders and aligning our actions with the kind of leaders we aspire to be. Even beyond leaders though, imagine what would the world be like if we all operated from that perspective in all our roles. A great reminder that brought to mind former bosses of mine that have both espoused this ethos and acting in quite the opposite manner! I like the “outside-in” perspective. Service is always defined by the one being served, not by the one serving. Adding customer in front is a good reminder of that. Perfect. Empower the employee to wow the customer. That’s exactly what we need sometimes… Thoughts of being recognised as a customer! It is crucial to know what others you lead may say about you. The best thing about helping others develop their skills is that it makes your job easier. Thank you @leadershipfreak for your valuable advice! I definitely want to see more on this. Listening and being present to our customers is key. It is nice to be important, but more important to be nice. I want to read more. Interesting.